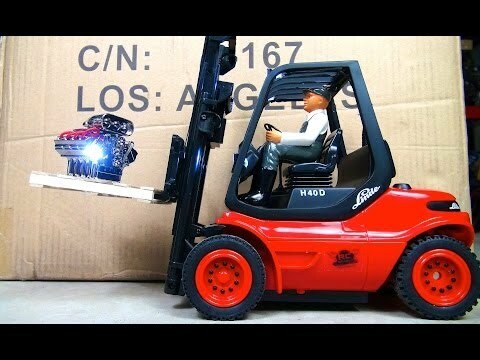 The Carson R/C Fork Lift Truck is the Linde H40D RTR operating on 2.4ghz in 1/14 scale. This radio controlled Fork Lift Truck comes completely ready to run with batteries included. The Carson Linde H40D forklift truck is a completely functional RC model and will make a great addition to every truck fleet. The 1/14 scale forklift is controlled via a 6 channel 2.4GHz transmitter. In addition to the many driving functions, the model also features a functional fork lift and a light and sound module. As it says on the box, ready to run, a very nice unit and being 1:14 scale it is the correct size to use with the trucks and so easy to load unload the semi-trailers. My forklift arrived in excellent order within two weeks down under in Salisbury, South Australia. Well packaged with care by Wonderland Models staff and no doubt posted rapidly by them for the model to have arrived at it's destination so soon. Well done to all..... Recommend Wonderland Models to all hobbyist. Ron R.